This colorful, hand-crafted Right at Home cloth activity book unzips to reveal activity-filled pages of fun, with eight familiar animals just waiting to be brought home. 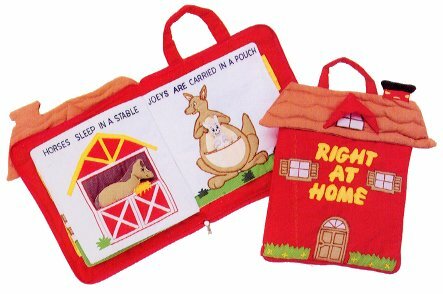 Kids can learn about where different animals live and our Right at Home cloth activity book will have children helping animals safely home for generations to come. Set Includes: Bee, Bird, Cow, Dog, Fish, Horse, Kangaroo and Turtle. Note: This Right at Home cloth activity book can be easily personalized at your local embroidery shop. Your child will love the excitement of hidden treasures in the pockets on each rhyming page and a surprise at the end.